← Is it the Mara Triangle or an orphanage for three cheetah cubs? The Kenya Wildlife Service has relocated the three cheetah cubs to Nairobi National Park’s orphanage. The latest video portrays the cubs in a cement cell. Even if they are moved within the orphanage is this in their best interest? Unless dire circumstances dictate, every option should be explored and implemented to keep wildlife in the wild. After all that is what the name wildlife means. In this situation the option to move the cubs to an orphanage instead of rehab and reintroducing them into the wild within the Mara Conservancy as conservancy officials were in the process of doing may backfire. The international outcry over this debacle is enormous and one can only think that perhaps tourism dollars will be lost as a result. My safaris will never include Nairobi National Park’s orphanage unless clients request a visit to the Sheldrick orphanage. This entry was posted in Mara's three cheetah cubs and tagged Cheetahs, Kenya Wildlife Service, Maasai Mara, Nairobi National Park Orphanage. Bookmark the permalink. 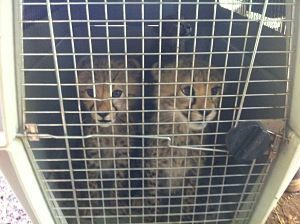 Cheetah cub update: courtesy of Kenya Wildlife Service they now are in an orphanage « Great Cats of the "World"